Making this pillow took about an hour (while I was watching television) and cost less than $4. 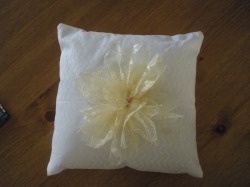 I used white cotton fabric for the pillow and 1/8 yard of yellow lace. 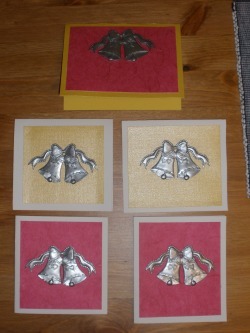 I still need to add a small fuchsia ribbon so that the rings can be tie on to it. I am also thinking about pitting a small fuchsia pearl in the center. This is my first official DIY project. I wrote cute little sayings on the inside and the end said "Will you be one of my bridesmaids?" The top one is my maid of honor's. 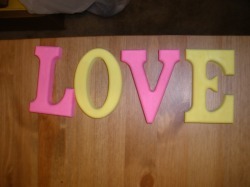 These letters are just styrofoam letters painted with our wedding colors. I got the letters from Michael's for $1 each. The cool thing about them is that they look wood and are sturdy, but are very light weight. A quick 1 hour project on a board day. I will most likely use these letters on the cake table.